Mastering Grain Cookery, 20,000-300 B.C.E. In 1000 B.C.E., when the first empires were being formed, the globe was home to fifty million or so people, about the population of present-day Italy, or slightly over twice that of Tokyo or Mexico City. Most of them were concentrated in a belt across Eurasia that swept from Europe and North Africa in the west to Korea and Southeast Asia in the east. Some still lived by hunting and gathering. Some were nomadic pastoralists who followed their flocks and herds. A tiny proportion dwelt in cities, most of which were inhabited by fewer than ten thousand souls, and even the biggest of which boasted no more than perhaps twenty-five thousand, the size of a small American college town. The overwhelming majority of people lived in hamlets and villages, growing their own food and trying to keep as much as they could out of the hands of the townsfolk. Hunters, herders, city dwellers, or peasants, each and every one of them depended on cooked food. Cooking had begun almost two million years earlier with the appearance of Homo erectus, according to the Harvard anthropologist Richard Wrangham. Other anthropologists have questioned this.1 However the matter is resolved, it is clear that humans have been cooking for a very long time. Before the first empires, indeed, long before farming, they had passed a point of no return where they could no longer thrive on raw foods. They had become the animals that cooked. Cooking softened food so that humans no longer had to spend five hours a day chewing, as their chimpanzee relatives did. It made it more digestible, increasing the energy humans could extract from a given amount of food and diverting more of that energy to the brain. Brains grew and guts shrank. Cooking created mouth-watering new tastes and pleasing new textures, replacing the slightly metallic taste of raw meat with the succulence of a juicy charred steak, for example, and fibrous, tasteless tubers with fragrant, floury mouthfuls. As humans became more intelligent and mastered more methods of cooking, other changes followed. It became possible to detoxify many poisonous plants and soften others that had been too hard to chew, so that humans could digest an increased number of plant species. This allowed more people to live off the resources of a given area as well as making it easier to settle new areas. Ways of treating flesh and plants so that they did not rot permitted the storage of food for the lean times of hard winters or dry seasons. Cooking had its disadvantages. Some nutrients and minerals were lost, although on balance, cooking tended to increase the nutritional value of food. New methods of cookery introduced new dangers, such as poisonous molds and seeds with grain cookery and, more recently, botulism with canning and salmonella with prepackaged ground meat, although in general cooking made food safer. And a heavy, unremitting burden fell on those who cooked. Even so, the many advantages of cooking outweighed the disadvantages. With cooking came cuisines. Techniques that proved successful with one kind of raw material were then used for others. A single raw material (such as grain) could be turned into diverse foods with different tastes and nutritional properties (gruel, bread, and beer). Instead of consuming food on the spot, humans began eating meals, since cooking required planning, storing ingredients, and time. Meals could be patterned to suit cultural preferences. Ordered styles of cooking-cuisines-became the norm. Leaving archaeologists and anthropologists to investigate the origins and early history of cooking, this book will take up the question of what these cuisines were, how they evolved, and what difference they have made in human history. Before moving to cuisines, though, it is necessary to say a little more about what cooking is and what techniques had been mastered at the time this book begins, in 1000 B.C.E. Cooking is often identified as the use of fire. As any cook knows, however, a lot more goes on in a kitchen, such as soaking, chopping, grinding, rolling, freezing, fermenting, and marinating. The multiple kitchen operations can be classified into four groups: changing temperature and often chemical characteristics (heating and cooling); encouraging biochemical activity (fermenting); changing chemical characteristics by treating with water, acids, and alkalis; and changing the size and shape of the raw materials using mechanical force (cutting, grinding, pounding, and grating, for example). By breaking long complex molecules down into shorter ones, adding water molecules to starches (hydrolyzing), and unfolding long chains of proteins (denaturing), heating makes food more digestible. It also makes it safer by rendering harmless the poisons that plants manufacture as a defense against predators. It creates new tastes and flavors, particularly the appetizing aromas associated with browning, a phenomenon known as the Maillard effect after Louis-Camille Maillard, the French chemist who first described it in 1912. The converse of heating-cooling or freezing-was found to slow spoilage. Fermenting-employing yeasts, bacteria, or fungi to alter the chemical composition of food-has similar benefits, increasing flavor, decreasing toxicity, improving digestibility, and preserving perishable foods, as well as reducing cooking time. Humans would have encountered the new tastes and pleasing effects of fermented honey, saps, and perhaps milk from early on. The history of their manipulation of such processes is lost, but they had probably learned that burying fish and meats (which is now known to create safe anaerobic conditions) prevented them from rotting and created tasty products. Soaking and leaching soften plant foods such as beans. These two processes reduce the toxicity of acorns, a common human foodstuff. Alkaline solutions, made by adding ashes or naturally occurring alkaline minerals to water, change the texture of foods, release nutrients, precipitate starch from fibrous plants, and aid in fermentation. Acid solutions, such as fruit juices or the bile in the stomach of herbivores, "cook" fish. The tough fibers of meat and plants could also be broken down through mechanical means. Flint or obsidian knives cut carcasses as fast as butcher's knives, a fact that always amazes my students when they try it. Stones pound and tenderize meat, shells or bones grate roots, mortars crack the hulls off grains, and grindstones reduce their kernels to flour. Breaking plants and animals down into smaller parts makes them easier to chew. It also enables the separation and removal of plant fibers that slow the passage of food through the digestive system (very important when food was more fibrous). Then, no later than 20,000 years ago, humans took on some of the most challenging of all plant materials to cook: the tiny, hard seeds of herbaceous plants. In the 1980s, archaeologists uncovered a small village dating to 19,400 B.P. close to Lake Kinneret, better known to many as the Sea of Galilee.5 Analyzing the food remains in hearths and trash dumps allowed them to reconstruct the cuisine. The villagers rarely ate big game, which was becoming scarce as the glaciers retreated. They had, however, thoroughly inventoried what could be turned into food. They cooked fish, twenty species of small mammals, and seventy species of birds. They also ate fruits, nuts, and beans from a hundred and forty different taxa, including acorns, almonds, pistachios, olives, raspberries, and figs. This huge selection of foodstuffs provided flavor and variety. For most of their calories, however, the villagers depended on the tiny, often hard seeds of herbaceous plants. The archeologists collected nineteen thousand samples, three-quarters of them only about a millimeter in length, or about the size of a mustard seed. Among them were grains of wild barley and wheat, which were to be crucial in subsequent human history. In one of the huts was a grindstone, the tool that can pulverize grains so that they don't pass whole through the digestive system. Thus about ten thousand years before the development of farming, cooks had mastered a wide array of culinary techniques, including those for dealing with the roots and grains that were the first plants to be domesticated. With these techniques in hand, it began to make sense to labor to plant, weed, and harvest these calorie- and nutrient-rich plants. By three thousand years ago, eight to ten root and grain cuisines, depending on how they're counted, had spread far from their places of origin, although many less-widely distributed cuisines adapted to specific local circumstances coexisted with them. Soon thereafter, root cuisines were to decline in importance as grain cuisines began to support cities, states, and armies. We know a great deal about some of the major cuisines from tools, art, and written records. Others are relatively little known, though that is shifting rapidly as new investigative techniques have been developed in the past few decades.6 The gaps in our knowledge of the major cuisines three thousand years ago can be partially filled by examining recent research on the origin and spread of farming from the perspective of cooking. When archeologists and anthropologists report the spread of one or another domesticated plant or animal, we can infer that culinary techniques and cuisines also spread, since without these farm products had no use. This is not an infallible inference. There are a few cases where plants were transferred vast distances without an accompanying transfer of cuisine and technique-wheat and barley from the Fertile Crescent to China several centuries B.C.E., and maize from the Americas to the Old World in the sixteenth century, for example. In general, however, transfers of groups of plants and animals reflect transfers of cuisine that made it worth applying the considerable skill, time, and energy needed to carry plants and move animals across mountains, deserts, and oceans, acclimatize them in new locations, and raise enough of them to make a significant contribution to the pantry. Seeds, slips, roots, and cuttings took up precious space in packs carried by humans or animals or loaded in crowded vessels. They had to be protected from salt spray, frosts, and the blaze of the sun. Food and water for animals meant less for humans when supplies were often short. On arrival, plants had to be coddled until they adjusted to new soils, climates, lengths of day, and seasonal patterns. Then they had to be propagated until there was enough to feed significant numbers of people. Global Culinary Geography ca. 1000 B.C.E. Using the sources described above, I survey the world's major cuisines, beginning with the Yellow River Valley of northern China and zigzagging around the most densely inhabited areas of the globe (map 1.1). Although our knowledge of these cuisines is changing rapidly, making specific dates and routes tentative, what is unlikely to change is the conclusion that they were based overwhelmingly on roots and grains and that they had spread very widely indeed. To anticipate, certain other broad generalizations will emerge. Cities, states, and armies appeared only in regions of grain cuisines. When they did, grain cuisine splintered into subcuisines for powerful and poor, town and country, settled populations and nomads. A feast following a sacrifice to the gods was the emblematic meal everywhere, the meal that represented and united the society, as Thanksgiving now does in the United States. It is not clear whether these global parallels reflect widespread contact between societies, the logic of emerging social organization, or a combination of the two. Steamed broomcorn millet (Panicum miliaceum) and foxtail millet (Setaria italica), tiny round grains from disparate botanical genera, were the basis of the first cuisine we encounter in the Yellow River valley in ancient China.7 There peasants lived in small villages, their dwellings half buried in the ground and roofed with thick thatch to protect against the freezing winters, and their interiors crammed with grain and preserved vegetables. Small patches of millet dotted the valley's fertile yellow soil, brought by flood and winds from the steppe. To prepare the millet, peasants lifted heavy pestles high above mortars and let them fall repeatedly until the inedible outer hulls were cracked (fig. 1.1). Beginning around the first century B.C.E., they used foot-trodden pestles to pound grain in a mortar buried in the ground, a less demanding method. When all the hulls were cracked, they tossed the grains in a basket, winnowing away the lighter hulls. Then they steamed the grains until they were light and fluffy in three-legged pots set over small fires, a method that conserved scarce fuel. Before dipping their fingers into the communal bowl, they offered a little to the gods and the ancestors. They accompanied the millet with bites of pickled vegetables, cabbage of various kinds, mallow, water-shield (an aquatic plant), or bamboo shoots, seasoned and preserved with costly salt. Sometimes, when they had trapped small wild animals, they had a bit of boiled or steamed meat, seasoned with Chinese chives, Chinese dates, or sour apricots. To supplement the millets, peasants turned to hemp seed, soybeans-which when steamed were dull, mealy, and gas-inducing-and rice, although it could not be counted on to ripen this far north. When their stocks dwindled before the harvest, they reluctantly resorted to wheat and barley, lumped together as mai, foreign grains, which travelers had brought from the Fertile Crescent in the Middle East, by around 2500 B.C.E. 8 Steamed whole like millet, these larger, harder grains stayed tough and chewy and were eaten only in the hungry time before the millet harvest. In small fortified cities aligned to the points of the compass, rulers like King T'ang, who founded the Shang dynasty around 1600 B.C.E., according to traditional Chinese historiography, dined with their warriors on a much more lavish version of millet cuisine. When the king's men seized their grain, the peasants protested: "Large rats! Large rats! Don't eat our millet! "9 The king promised them that the sacrifices he made to the gods and ancestors would ensure them many children, bountiful harvests of millet, and victory in battle over rival monarchs and the Yi, Man, Jung, and Ti barbarians, who were said to eat neither grain nor food cooked with fire. Moving several hundred miles south to the Yangtze River, we come to the tropical monsoon region, which stretched from the South China Sea to the forest-covered archipelagoes of Southeast Asia and the shores of the Indian Ocean. We know much less about the two cuisines of this region, one based on roots, the other on rice, than we do about the cuisine of the Yellow River Valley, so what follows is tentative. To begin with the root cuisine, taro (Colocasia esculenta), yam (the starchy root of a vine of the Dioscoreaceae family, much tougher than the sweet potato), and the cooking banana (the starchy, high-yieldingfruit of Musa spp., as well as its root), were boiled or steamed, and most likely pounded to pastes that could be scooped up with the fingers. People on the oceanic side of New Guinea loaded outriggers with the basics of this culinary package and sailed east into the Pacific. To sustain themselves at sea, they stowed lightweight, long-lasting dried or fermented fish, breadfruit (Artocarpus altilis), and bananas for food. They filled gourds and bamboo sections with water, and in addition drank the water inside coconuts.15 They packed slips, cuttings, young plants, and taro and yams in moist moss, then wrapped them in a covering such as ti leaves or bark cloth, tucked them into palm-leaf casings, and hung them out of reach of salt spray. Breeding pairs of pigs, chickens, and dogs, which, if worst came to worst, could be eaten on the way, were carried on board. Between 1400 and 900 B.C.E., they settled many of the South Pacific islands; by between 500 and 1000 C.E., they had added Hawaii and New Zealand. Since most of these islands had few edible animals or plants, and above all no calorific starchy plants, the voyagers would have died had they not carried their own culinary package. In Hawaii, for example, they survived on flightless birds (now extinct) until the plants and animals they carried were established. Since theirs was a volcanic island without clay for pots, Hawaiians pit-baked taro and breadfruit and pounded them to a paste. They seasoned this with raw or cooked fish, grated coconut or coconut cream, roasted and ground candlenuts (Aleurites moluccana), seaweeds, or just a dip of seawater. For feasts, from which women were excluded, they pit-baked pig, dog, or large fish. Probably by the first millennium B.C.E., other voyagers had sailed west to Madagascar with yams, bananas, and stowaways such as rats and mice. Whether the evidence supports the claim that they were established in West Africa as well by 1000 B.C.E. is still being debated.16 Australia, settled by 50,000 B.C.E. by humans and their dogs, remained isolated from these later voyages. Asian rice cuisines in the monsoon area were also connected over large distances, rice (Oryza sativa) from the Lower Yangtze Valley having hybridized with rice from the Ganges Delta by 1000 B.C.E.17 Cooks pounded or soaked and boiled the whole grain until the hull split, winnowed it, and then boiled or steamed the granules until tender. Alternatively, moistened grains could be pounded to flakes and dried to create for an instant food for travelers.18 Likely accompaniments in the Indian Ocean region were stews of water buffalo, pork, dog, chicken, or fish, perhaps soured with tamarind pod pulp or made creamy with milk extracted from grated coconut flesh. Sugar palm sap was made into a refreshing, and after a day, slightly intoxicating drink, or evaporated to form a sticky, brown aromatic sugar. Sugarcane, a perennial grass, was sweet to chew but too difficult to process to be a major part of the diet. It's possible that betel, the nut of a palm, was already being wrapped in the leaf of a vine from the same family as black pepper and chewed as a mouth freshener, as it is today. Moving northwest, we come to the central area of barley-wheat cuisines, whose easternmost edge abuts the Yellow River. Originating in places such as the village on Lake Kinneret in the Fertile Crescent, the quarter-moon-shaped area extending from the eastern coast of the Mediterranean up through the eastern part of Turkey and down the valley of the Tigris and the Euphrates, this family of cuisines had spread west across the Mediterranean and Europe, south to North Africa, and east to Iraq, Iran, and northwest India. In most of the barley-wheat region, yogurt and butter were also made from the milk of cattle or sheep and goats. Barley, preferred to wheat, was not usually boiled or steamed, as it was in the Yellow River Valley, but made into a flavorful, grayish flatbread; a porridge or pottage of cracked grains flavored with herbs, vegetables, or meat; or a thick, flat beer. For bread, cooks pounded the inedible hulls of barley and wheat in pestles and mortars until they cracked, winnowed them away, then knelt to grind the grains on a stone (fig. 1.3). They mixed the meal (whole ground grain) with water and baked the dough. In the Indus Valley, the Nile Valley, and Mesopotamia, the land between the Tigris and the Euphrates, barley-wheat cuisine supported small cities by 3000 B.C.E., as millet cuisine supported them in the Yellow River valley.19 The cuisine of Mesopotamia is the best known of the barley-wheat cuisines, already thousands of years old in 1000 B.C.E. It was prepared in cities and villages on the flat plain, hot and parched much of the year, partly marshy and covered with reeds, the home of fish and waterfowl, featureless except for the channels bringing water to irrigate the fields and the date palms lining the pathways between the fields. The abundance of rich soil and water for growing barley and wheat outweighed the lack of timber, building stone, and other resources. The ruling classes, living in cities dominated by temples in the form of square stepped pyramids, enjoyed a rich, complex cuisine. Again the exemplary meal was a feast following a sacrifice. A particularly important sacrifice was offered at the New Year, to ensure that Dumuzi, god of vegetation and fertility, sheep and sheepfolds, and the underworld, would return to the earth's surface and reunite with his spouse, Inanna, Queen of Heaven, goddess of love and war. Then the rains would come and the cycle of life would begin anew. A Sumerian vase from ca. 3000 B.C.E. (fig. 1.4) shows cereals on the bottom, then a procession of sheep and goats, and finally naked men carrying baskets of fruits and grains to Inanna, backed by two bundles of reeds, her signs of status. One version of the Epic of Gilgamesh, revised and modified over thousands of years of Mesopotamian history, describes the sacrifice that Gilgamesh offered to Inanna in thanks for helping him survive the great flood. "Seven and again seven cauldrons [he] set up on their stands, [he] heaped up wood and cane and cedar and myrtle." The worshippers prayed that the vindictive, unpredictable, and demanding goddess would be satisfied with the offering. Honey was poured into a carnelian vase, butter pressed into one of lapis lazuli.The priest sacrificed an animal and poured a libation of beer. The aromas rose into the sky, and "when the gods smelled the sweet savour, they gathered like flies over the sacrifice. "21 The participants picked up straws of solid gold and silver and sipped from the vat. Musicians strummed their harps. The diners plucked the fragrant meats and sighed with satisfaction over the rich dishes. A sacrificial feast included sauces, sweets, and appetizers, hallmarks of high cuisine. Fried grasshoppers or locusts made tasty appetizers. Pickles and condiments concocted from seeds, sesame oil, vegetables, fruits, garlic, turnip, onion, nuts, and olives titillated the palate. Sauces were prepared from an onion-and-garlic flavoring base combined with a rich fatty broth thickened with breadcrumbs, the ancestors of sauces still served in the Middle East and even of present-day English bread sauce. Pomegranates, grapes, dates, and confections of milk, cheese, honey, and pistachios provided a sweet touch. Professional cooks labored in kitchens as large as three thousand square feet, much of the space devoted to making grain-based dishes, bread, and beer. From the coarse groats and fine flour produced by the grinders-perhaps prisoners and convicts-cooks prepared porridge, flat breads, and slightly leavened breads, the latter in three hundred named varieties. Dough was shaped into the forms of hearts, hands, and women's breasts, seasoned with spices, and filled with fruit, with the texture often softened by oil, milk, ale, or sweeteners. A flour-oil pastry was enlivened with dates, nuts, or spices such as cumin and coriander. Stuffed pastries were pressed into an oiled pottery mold with a design on the bottom before baking. Flatbreads were baked on the inside walls of large ceramic pots (tannurs). There is some evidence that bulgur, an easy-to-cook food (familiar today from tabbouleh salads) was made by drying parboiled wheat. Dates were turned into wine, or like grapes and figs, dried in the sun so that they could be stored. Sesame seeds were pressed to yield oil, which, like butter and precious honey, was packed in jars. Fruits were preserved in honey, and fish in oil, while beef, gazelle, and other fish were salted. To make a rich sauce (siqqu) akin to contemporary Southeast Asian fish sauces, fish and grasshoppers were fermented with salt in pots. The Greeks described barley as the gift of the goddess Demeter. Cooks soaked the grain, dried it, then roasted it in a shallow pan over the fire before grinding it to meal. This could be eaten as it was by travelers, mixed with water to make a gruel or porridge or with water, milk, oil, or honey to make small flat bannocks (maza), the bread of the Greeks. Accompanying the barley dishes were beans or lentils, greens or root vegetables, eggs, cheese, fish, and occasionally mutton, goat, or pork. In hard times, they could fall back on acorns and wild plants such as mallow (in the Malvaceae family), asphodel, and vetches, normally the food of nomads, not settled peoples. They drank wine, the gift of Dionysius, mixed with water, not beer like the Mesopotamians and Egyptians. Turning back to the south, we leave the barley-wheat cuisines to examine three overlapping cuisines in Africa south of the Sahara for which we have less evidence.33 In the grasslands of Sudan and the Ethiopian highlands, people depended on grains-millets again, though of different botanical classifications than those of China. They pounded pearl millet (Pennisetum glaucum), finger millet (Eleusine coracana), and sorghum (Sorghum bicolor) and cooked the meal with water to prepare gruel. The cattle that they herded were a mix of Indian zebu cattle from India (Bos indicus) with native species that tolerated drought and resisted tsetse flies, further evidence of contacts between the two regions. To the west, on the southern borders of the Sahara, was a grain cuisine supplemented by roots. Cooks pounded, winnowed, and boiled African rice (Oryza glaberrima). They boiled yams (genus Dioscorea), cowpeas (Vigna unguiculata), and Bambara groundnuts (legumes that, like peanuts, ripen underground). Perhaps then as now, they pounded the roots to a paste, which they rolled into spheres a little smaller than golf balls to pop into the mouth. Oil from the red fruit of palms (Elaeis guineensis) helped the paste go down. Guinea fowl, goats, and possibly dogs provided meat. Sweetness came from honey. In the tropical forest zone along the West African coast there was a root cuisine consisting of pounded starches (fufu now being the most widely used name) made of boiled and pounded yam, taro, or plantain and, later, bananas. They were accompanied by cow peas, pigeon peas, yam beans, Bambara groundnuts, and bitter green vegetables. Oil palm sap spontaneously fermented to kicky palm wine within two or three days. Over subsequent centuries, migrants from the eastern grassland and the tropical forests merged the millet-beef cuisine with the yam-banana cuisine in East and Central Africa. Before investigating why roots, and particularly grains, became such popular choices as culinary staples, let me clarify that I use the terms "grain" and "root" in a culinary, not a botanical, sense. Just as the ancient Chinese lumped together cereals, soy, hemp, and other plants under the single term ku, and the ancient Indian philosophical works, the Upanishads, described sesame, kidney beans, lentils and horsegram, barley, wheat, rice, and a couple of millets as the food grains, I include seeds of various families of annual herbaceous plants, including grasses (Gramineae), beans and peas (Leguminae), mustards and cabbages (Brassicaceae), and so on, which required similar processing and were frequently mixed together.38 Roots are all underground food storage chambers for plants, including corms and tubers, such as cassava (Manihot esculenta), taro (Colocasia esculenta), yam (Dioscoreaceae family), sweet potatoes (Ipomea batatas), and potatoes (Solanum tuberosum), along with other less important species such as papyrus (Cyperus) in Africa, camas (Camassia) in North America, and oca (Oxalis tuberosa) in the Andes. I will say more about grains than about roots because they were to be much more important in the history of cuisines. Roots and grains have many advantages. They are rich in calories and nutrients because they provide sustenance for the next generation of plants. They often grow abundantly in the wild. They also can be easily harvested, as American botanist Jack Harlan demonstrated in the 1970s by reaping four pounds of einkorn wheat (an archaic variety that still grows wild in parts of Turkey) in just an hour with a flint sickle. Roots could often be harvested year-round or left in the ground without rotting, and grains could be stored in granaries to provide food in the difficult seasons of cold, drought, or heavy rain, depending on the region. Few other candidates for plant food measured up. Although some fruits, particularly bananas and breadfruit, also provided substantial calories, most were small, sour or bitter, seasonal, and hard to stockpile. Nuts, such as acorns, chestnuts, pine nuts, coconuts, and hazelnuts, are rich in calories but many are so oily that they cause diarrhea when eaten in large quantities. Because nut-bearing trees often take years to fruit, migrants who needed to reproduce cuisines quickly in a new place would have been less likely to move nuts than to move roots and grains. Leaves and shoots, low in calories, often bitter, and difficult to store, were used mainly as medicines.39 Most societies, therefore, came to depend on two or three favorite roots or grains to provide most of their calories, that is, as their staples. Other foodstuffs, such as meat, fruits, and vegetables provided flavor, variety, and nutritional balance. The staples that humans had picked out centuries before 1000 B.C.E. still provide most of the world's human food calories. Only sugarcane, in the form of sugar, was to join them as a major food resource. If they are to be turned into bread, grains have to be ground. When I was a little girl, my father decided to make some flour from the wheat we had grown on the farm. He tried pounding it with a pestle and mortar but all he got was broken grains, not flour. He put it through the hand mincer screwed to the edge of the table with the same result. Finally, he attacked it with a hammer on the flagstone floor. After he gave up, defeated, my mother cleared up the mess. It was sobering to realize that if the commercial millers vanished, we could have starved even with barns full of sacks of wheat. To turn wheat into flour, you have to shear, not pound, the hard grains, which requires a grindstone, as the people of Lake Kinneret had discovered. A friend in Mexico, where hand grinding still goes on, showed me how it worked. She knelt at the upper end of a grindstone, called a metate-a saddle-shaped platform on three inverted pyramidal legs, hewn from a single piece of volcanic rock. She mounded a handful of barley, took the mano, a stone shaped like a squared-off rolling pin, in both hands with her thumbs facing back to nudge the grain into place, and, using the whole weight of her upper body, sheared the mano over the grain. After half a dozen passes, she had broken the grains, which now clustered at the bottom end of the metate. Carefully scraping them up with her fingertips, she moved them back to the top, and started shearing again, this time producing white streaks of flour. By the time she had sheared the grain from top to bottom five or six times, she had produced a handful of flour. Grinding may look easy, and it is, for the first ten minutes. To grind a quantity of grain, though, as I found out when I tried, takes skill, control, physical strength, and time. I was quickly panting, sweaty, and dizzy, my hair in my eyes, and the mano slipping at awkward angles. Grinding is hard on the knees, hips, back, shoulders, and elbows, causing arthritis and bone damage. Grinding is lonely, too exhausting to allow for chatter. Kneeling to grind with the breasts swinging can be seen as submissive, demeaning, and sexually provocative, as lascivious eighteenth- and nineteenth-century illustrations of Mexican women grinding make clear. The heavy labor was relegated to women, convicts, and slaves, called "grinding slaves" in the technical language of seventh-century English court documents.42 Even today Mexican women in remote villages grind five hours daily to prepare enough maize for a family of five or six. For generation upon generation of grinders in the bread-eating parts of the world, the author of Genesis (3:19) had it nailed. "In the sweat of thy face shalt thou eat bread, till thou return unto the ground; for out of it wast thou taken: for dust thou art, and unto dust shalt thou return." Rachel Laudan tells the remarkable story of the rise and fall of the world’s great cuisines—from the mastery of grain cooking some twenty thousand years ago, to the present—in this superbly researched book. 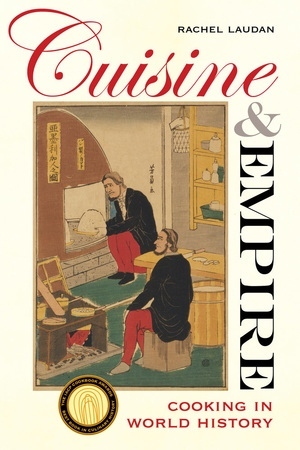 Probing beneath the apparent confusion of dozens of cuisines to reveal the underlying simplicity of the culinary family tree, she shows how periodic seismic shifts in “culinary philosophy”—beliefs about health, the economy, politics, society and the gods—prompted the construction of new cuisines, a handful of which, chosen as the cuisines of empires, came to dominate the globe. Cuisine and Empire shows how merchants, missionaries, and the military took cuisines over mountains, oceans, deserts, and across political frontiers. Laudan’s innovative narrative treats cuisine, like language, clothing, or architecture, as something constructed by humans. By emphasizing how cooking turns farm products into food and by taking the globe rather than the nation as the stage, she challenges the agrarian, romantic, and nationalistic myths that underlie the contemporary food movement. Rachel Laudan is the prize-winning author of The Food of Paradise: Exploring Hawaii’s Culinary Heritage and a coeditor of the Oxford Companion to the History of Modern Science. 1. Mastering Grain Cookery, 20,000–300 B.C.E. 2. The Barley-Wheat Cuisines of the Ancient Empires, 500 B.C.E.–400 C.E. 3. Buddhist Cuisines, 260 B.C.E.–4800 C.E. 4. Islam Transforms the Cuisines of Central and West Asia, 800–1650 C.E. 5. Christianity Transforms the Cuisines of Europe and the Americas, 100–1650 C.E.